What is it about dead authors' desks that I love? A highlight of my trip to France a few years ago was seeing firsthand where Victor Hugo stood to write, overlooking an archetypal Parisian square. 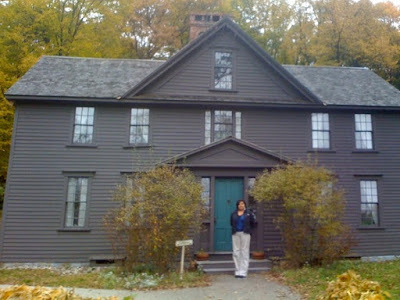 Today I took my beloved visiting mother-in-law to Orchard House, where we joined a group of high school English students on a tour of Louisa May Alcott's domain. After moving twenty-two times in nearly thirty years, the Alcotts settled from 1858-1877 in Orchard House, which dates to circa 1690-1720. The prolific Ms. Alcott wrote for fourteen hours at a stretch, switching to her left hand when her right one grew tired, and completed the first half of LITTLE WOMEN in two months during 1868. Alcott, unlike the other L.M., was prescient enough to secure a royalty for that bestseller instead of the flat fee given to Montgomery. 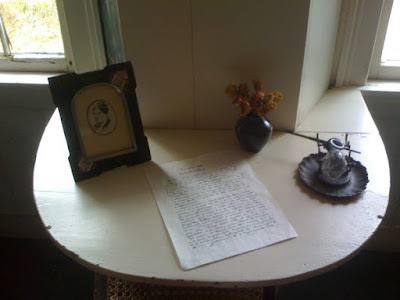 Louisa's father, Bronson Alcott, built a shelf desk in her bedroom overlooking the tall elms and apple trees surrounding their house.